It’s no exaggeration to say that in-flight connectivity is boardroom talk for airlines around the world. They are increasingly leveraging connectivity through passenger mobile apps and devices to increase brand engagement and provide a seamless on-line experience from home to airport, boarding and in-flight, and to destination. Inflight connectivity is opening up a new stream of added-value content and services that passengers will want to buy and that offers a substantial affiliate revenue prize to airlines, estimated at some $60 billion a year globally, and growing fast. Over the next decade, the number of commercial aircraft equipped with a mobile WiFi service is projected to grow nearly tenfold as more airlines provide satellite-based WiFi connectivity to both cabin and cockpit (source Northern Sky Research). By 2025, some 26,000 mobile aero terminals are expected to be in service, compared to 2,700 today and revenues from airline connectivity suppliers are expected to be more than €6.5 billion. Operational data for aircraft health monitoring and flight operations is also expected to be a significant growth area over the next 20 years with some forecasts projecting business valued at $5 billion. 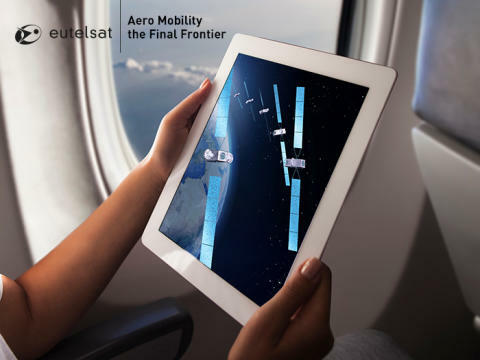 Mobility services, principally in-flight, are one of Eutelsat’s fastest-growing activities. They currently generate 5% of revenues and are expected to see annual double-digit growth over the coming years, driven by new partnerships, technology innovation and investment in infrastructure optimised for this vertical. Read our white paper to learn more about how geostationary satellites are transforming the in-flight experience.